Now here’s a door closed to me! I managed to get inside to reception before being very firmly told this Library was for members only. Well…that was a massive disappointment. Not even a mooch around unless I was prepared to join and pay my dues! Not even a quick look? Stern Icy look in reply…well that’s me told off! So here’s the best I could do, looking in from the outside. Gallery | This entry was posted in Doors and tagged Door of the London Library, England, Library, London, Susan Sheldon Nolen's Doors, The London Library, Travel photography. Bookmark the permalink. That must be a very snobbish library anyway Susan, I would have told them they were not good enough for you. I was a little miffed to say the least! Later on, I found out it was privately owned, meaning not owned by the government, so had to charge fees to stay afloat! I wish though the girl at the front desk had been a little kinder! What a gorgeous door! I’m sorry your experience with the girl at the front desk was less than pleasant. Hi Fannie! A smile would have all the difference in the world. Never mind eh. As far as that woman is concerned…you can always tell a book by it’s cover. humph! Good one. Wish I had thought of that on the day. Right proper chuckle! Hullo. 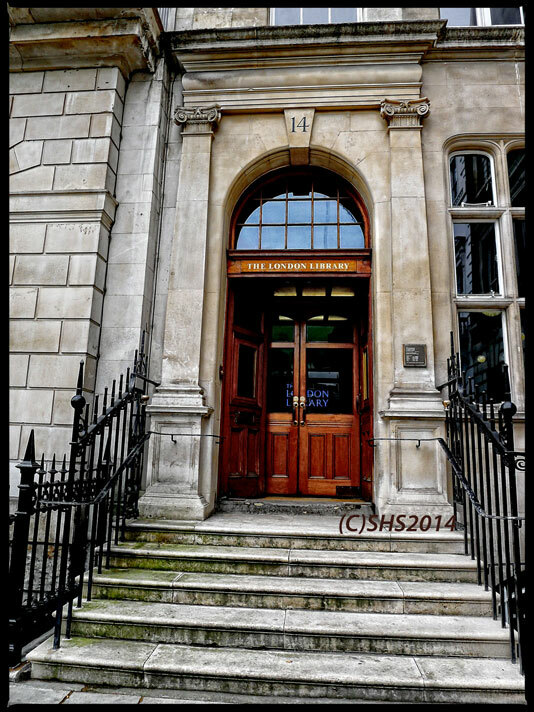 I’m a member and general admirer of the London Library and I stumbled on this post. Sorry to read of your frustrating experience at the front door. From my experience, the front desk staff are usually very friendly. Alternatively, I’d be happy to give you a short tour around the building myself. Members are allowed to do that from time to time, as long as they sign the visitor in and out, and stay with them. Let me know…! Hi Dikon, thank you for stopping by and for your lovely reply. I certainly will stop by and have a look around. I do wish the girl that day, had simply said, we do have tours, rather than – sorry, its for member’s only. It was as I wrote, rather off putting, but saying that we all have bad days. I’ve been known to have one whenever the coffee machine is not working! Many thanks for this response, I’m sure my reading friends will be pleased to see this! We were sorry to read about your recent experience at the Library’s reception, this appears to be an unfortunate exception to the usually warm welcome we give to members of the public who visit the Library. We hope you will still be interested in having a tour of the Library at some point – you are welcome to join one of our free public tours which run twice a month, alternatively please do feel free to take up Dickon Edwards’ kind offer to visit as his guest. Once again, our apologies and we hope to welcome you at the Library in the near future. I certainly will at some point take you up on your offer! Many thanks! I look forward to a tour!